If you are currently looking for an elleptical trainers with among budget $300 until $1000, we already prepare you two options of them. One is coming from Scwinn 430 and other is Nautilus E614. Why we recommend them, because not only us, on the outside there are many reviews are done comparing between Schwinn 430 and Nautilus E614. We also want to help you instead of find the similarities and differences contain in each elliptical trainers. now, your problem about feeling confuse to choose your best elliptical trainers will be lost by reading every detail that we provide in this article. Enjoy it! The Schwinn 430 is a trainer with automatic magnetic resistance, featuring 20 tension levels and 22 onboard programs. The resistance is one of the best called eddy current resistance. The brake of this machine involves a magnetic brake pad and its pull is controlled via electric current.And since it’s an eddy current brake machine, the resistance is controlled exclusively from the console. It is also featured with a manual incline ramp, 6 levels from 0 to 10 degrees which is a plus value to diversify your workout spectrum, combining various resistance and incline settings. There are a belt drive system and flywheel which are really smooth. The weight is about 10 lbs and situated in the main frame case, in front of the pulley. The footplates (or pedals) are articulating, which means they move with each step, slightly adjusting to your stride and posture, to eliminate any stress that may occur in your ankles and knees. And last, The main frame of the Schwinn 430 consists of two main pieces, which attach at the middle. There are three bases on which the machine rests on the floor. The middle and rear bases are finished with adjusting levelers. The front base features two plastic wheels which help with the relocation of the assembled machine. Nautilus E614 features a front base consisting of a triangular tube with rubber feat and offers design that aims to cover all levels of workout that can be achieved on an elliptical trainer. The frame of Nautilus E614 are the front part with the flywheel case and the front base is equipped with transport wheels. It has a 72 x 27 inches (182 x 68 cm) footprint, and evidently requires a little bit of clearance on each side, on its front and in the back, and also 167.3 lbs of machine weighs. Like most elliptical trainers, the Nautilus E614 features both fixed and mobile handgrips. The mobile ones are longer, and slightly inclined towards the main axis of the frame, for a naturalnautilus elliptical e614 footrests and ergonomic grip. Beside of that, The Nautilus E614 features a manual incline system, with 6 levels of incline. Evidently, this particular feature diversifies the array of possible workout routines. The machine is provided with belt-driven, featuring a heavy-duty belt, stretch-resistant, made to last for many years of use. The drive system also involves a large pulley and a perimeter-weighted flywheel, meant to render a smooth motion. 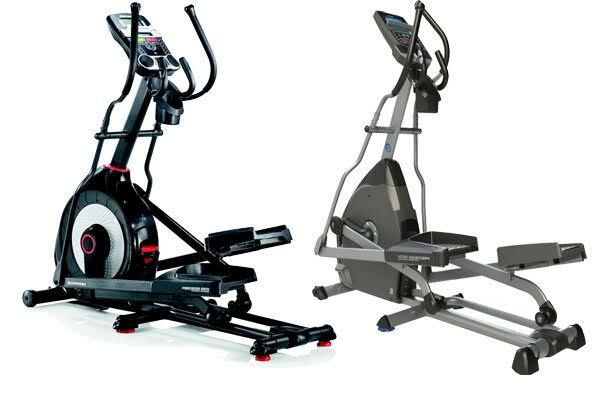 Same as the Schwinn 430, The resistance system features an eddy current brake, which means the resistance is controlled exclusively through the console of the machine too. The Nautilus E614 costs a little more than the Schwinn 430 model though but pretty much the only difference is the construction of the front base. This model features a front base consisting of a triangular tube with rubber feet, while the Schwinn has a cylindrical tube base, with caps on the ends, rather than feet. We know this is maybe a hard decision to be made. But, by purchasing a bit more money for Nautilus E614 is better because, you know you will get more advatages for a long-term using a elliptical trainer.